If basic roasted chicken seems like the easiest thing in the world, why do so many of us just buy the already roasted ones at the grocery store? It reveals a certain truth: roasted chicken isn't so simple. It sounds easy, but there's more to it. How do you cook it long enough to ensure you don't kill your family with salmonella but not so long that it dries out and no one wants to eat it? Should you truss it? And what does that mean exactly? Should it be breast or back side up? What should you put it in? Does it even matter? Should it be stuffed? Seasoned? Coated in butter? Skinned? In short, there are a lot of questions, and everyone has a different answer. 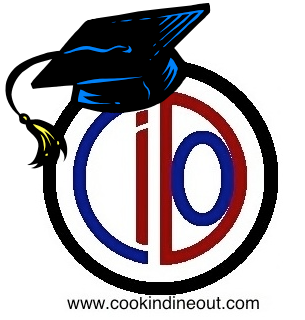 Seems like the perfect time for a Cook In 101. Roasted chicken doesn't have to be complicated, but there are a few things to think about. Consider the chicken: the torso with the breast and back sections is thicker than the wings, thighs and drumsticks that stick out of it. So there is a differential to deal with: the breast takes longer to cook than the extremities. Hence the trussing: a method of tying the wings and legs of the bird to its body so that the whole thing cooks more evenly. There is a downside though: pressing the wings and drumsticks against the body will prevent the skin from browning. To get a better view into what happens with roasted chicken, I'm presenting two variations here. In the first, the bird is trussed and roasted by itself at a high temperature. In the second, the bird is not trussed and roasted on a bed of vegetables starting at a high temperature and finishing on a lower one. Both of these methods have their pros and cons, which I'll discuss below. In both cases, I've used a basic 9 x 13 glass baking dish for the chicken. A roasting pan with a v-rack would probably work better; however, as a Cook In 101 piece, this is geared toward people with basic kitchen equipment, who should include a 9 x 13 dish but might not have a roasting pan. Always place the chicken in the roasting pan breast-side up. That way the skin that covers the breast will get nicely browned during cooking. The Solo Roast Chicken is great because it's pretty fast and requires few ingredients. The chicken tastes amazing. However, there's a major downside to preparing this recipe using a 9 x 13 pan: it makes a incredible mess in the oven. 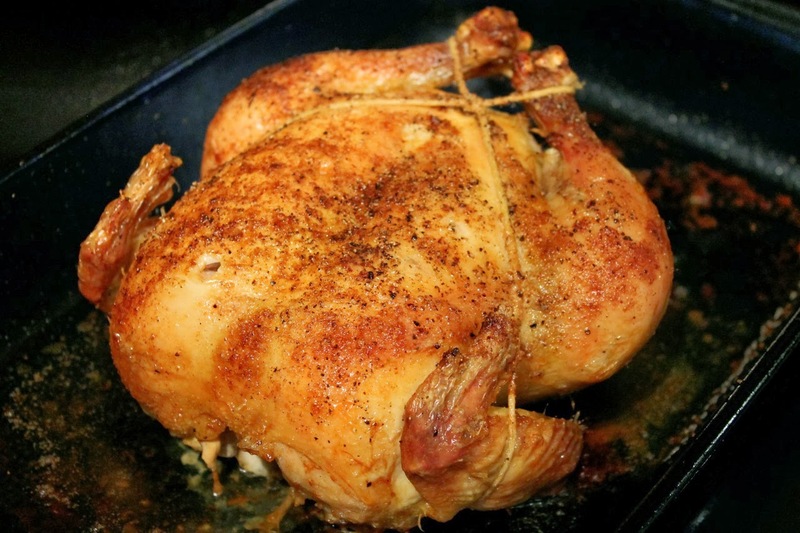 As chicken roasts, it renders water and liquid fat. These things do not play well together. As they drip off the chicken and hit the hot glass of the roasting pan they sizzle. And at a high temperature, this creates mini streams of super-heated fat that coat the roof, sides and bottom of your oven. And of course, the oven is really hot, so it all bakes on rather nicely, making it hard to clean off. The next time you go to use your oven, be prepared to set off some smoke alarms. It's not pretty. In contrast, a roasting pan has steeper sides and is thus more likely to contain such splatter. Filling the bottom of the roasting pan with a little water helps too (or so I've read, I haven't tried it), but with a 9 x 13 pan, that wouldn't work very well, as you'd end up stewing the bottom part of the chicken instead of roasting it. Trussing a chicken isn't that hard: cut about 4 feet of string. Tie a knot around the ends of the drumsticks to pull them together (I used a square knot), bring the ends of the string around the body of the chicken so they overlap the wings and flatten them against the body, then tie another knot on the opposite end of the chicken to keep the wings in place. Use scissors to cut off any excess string. In the Solo Roast Chicken recipe below, I trussed the bird. And then for the Chicken Roasted on a Bed of Vegetables, I didn't. Frankly, I didn't notice that it made that much difference. I imagine if you roasted the chicken at a lower temperature, and thus for a longer time, it might be more important. Here's a nice experiment comparing side-by-side results of trussing and not trussing. I like the second method with the vegetables better for a couple reasons. First, the vegetables collect the dripping juices, keeping them from splattering. And second, you end up with a delicious side of roasted vegetables flavored with the chicken drippings. A pretty decent bonus. 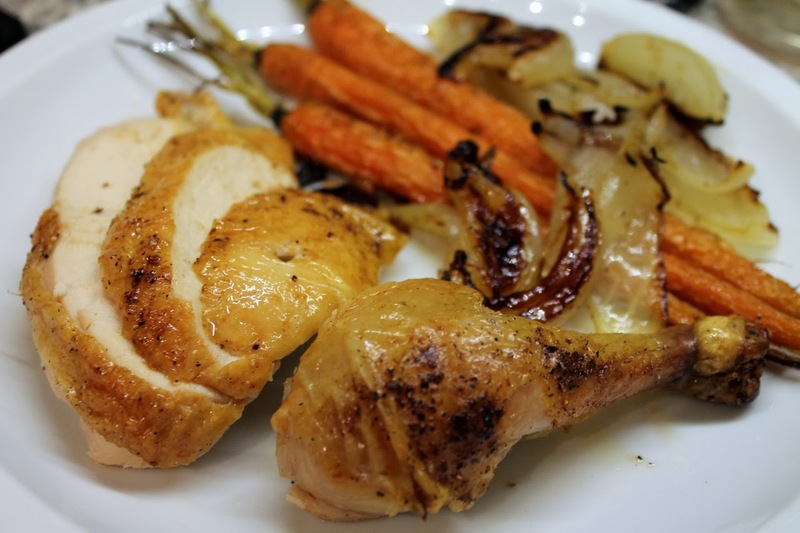 Apart from the vegetables, this recipes is identical to the solo roast chicken. It might take a little longer to cook, but it's still done in just over an hour. The only real downside to this method is that because the chicken is in contact with vegetables, the bottom side won't get browned, but it will get cooked. 1. Let the chicken rest 5 to 10 minutes. This allows the juices to redistribute through the meat and reduces the amount that will end up on your cutting board. 2. Place the chicken on a cutting board, preferably one with a "ditch" around the edges for the juices to run into. 3. Pull the drumstick away from the body and find the joint where it bends away from the thigh. Using a sharp knife (such as carving knife or chef's knife), cut through this joint and remove the drumsticks. Similarly, pull the thigh away and find its joint with the body and cut through this joint (you'll have to cut through the skin as well, so it's not always obvious where the joint is, but it doesn't have to be perfect). 4. Similarly, pull the wing away from the body to locate the joint and cut through this to remove the wings. At this point, you're left with the chicken's main torso. Find the breasts--the really meaty side, and cut them away from the body--they'll be about an inch thick at the most. Slice vertically through the breast to create breast cuts about 1/2-inch wide. Pay attention to the skin as you're cutting. You want to be careful not to cut it away, since it has a lot of flavor. A very sharp knife works best for this. 2. Pat chicken dry with paper towel. Salt the chicken's cavity with kosher salt and stuff it with thyme sprigs. 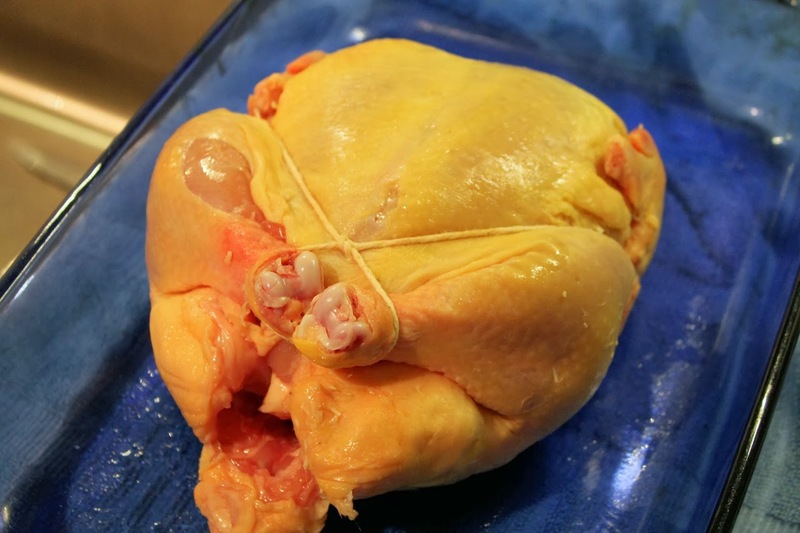 Truss the chicken by tying the drumsticks together with a 4-foot piece of kitchen string, then wrapping the string around the body of the chicken, overlapping the wings to hold them against the body, and tying a second knot on the back of the bird. Cut any loose string with scissors. Spray or brush the chicken all over with olive oil, then season with seasoned salt and pepper. Place the chicken in a 9 x 13 baking dish, breast-side up. 3. Roast for 30 minutes. Decrease temperature to 400 F. Roast another 25 to 35 minutes until an instant-read thermometer reads 165 F (chicken temperature should rise another 4-5 degrees, at which point it will be done). Cut and remove the kitchen string. Carve the chicken and serve. 2. Combine carrots, onion and potatoes in a large bowl. Drizzle with olive oil and sprinkle with rosemary, salt and pepper. Toss to combine then transfer to the bottom of a 9 x 13 baking dish. 3. Pat chicken dry with paper towel. Salt the chicken's cavity with kosher salt and stuff it with thyme sprigs. Place the chicken on top of the vegetables. Spray or brush the chicken all over with olive oil, then season with seasoned salt and pepper. 4. Roast for 30 minutes. 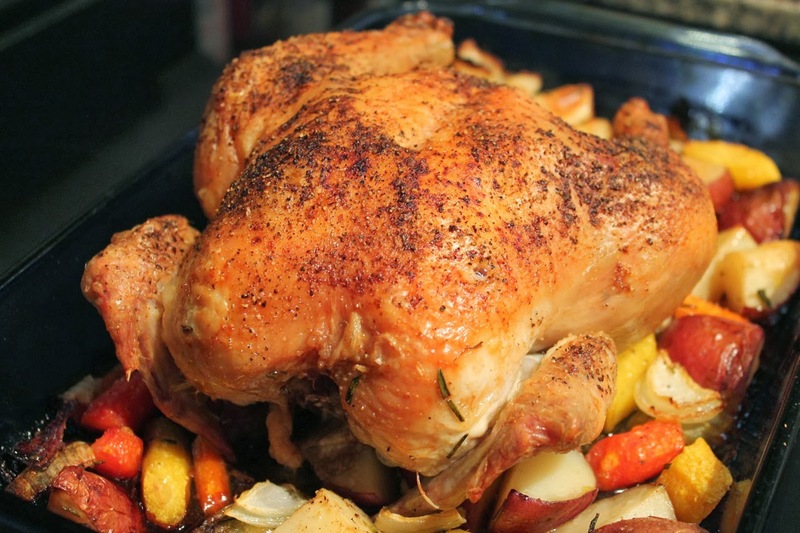 Decrease temperature to 400 F. Roast another 30 to 40 minutes until an instant-read thermometer reads 165 F (chicken temperature should rise another 4-5 degrees, at which point it will be done). Carve the chicken and serve with the vegetables.
. Here's an easy way to do that. 2. Combined vegetables in a large bowl. Add olive oil, season with salt and pepper and toss to coat. Spread vegetables in an even layer on a baking sheet. 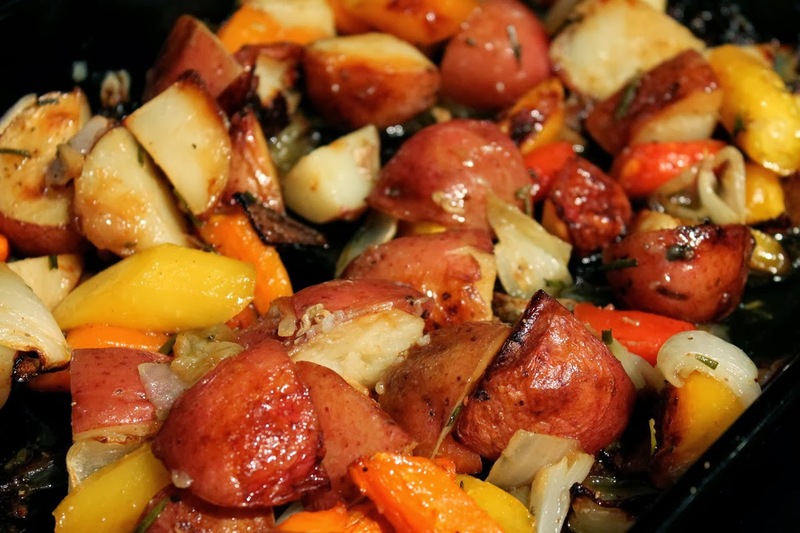 Roast for 35 to 45 minutes until vegetables are browned and tender. Nice piece! Reading your step-by-step instructions makes me appreciate how much work you put into preparing our food. Also, your readers should know that your roasted chickens taste as delicious as they look in these pictures.